Home » Acro Yoga » What a (re)treat! With Pilates Elevate – our Pilates and Acro/Aerial Yoga Retreat on the horizon in May 2017, I wanted to share with you a beautiful little story written by Lucy Kewley about our last Bali retreat. Enjoy! Have you ever been fortunate to go on a retreat? Do yourself a favour and go! Start saving. Do something to make some pennies – sell your clothes, syphone money out of your grocery allowance (don’t tell my husband! ), save the money you would have spent on that evening out… whatever! JUST MAKE A PLAN! A few years ago I was very fortunate to go on a retreat to BALI with a very dear friend of mine. She was actually leading the retreat with another incredible girl. 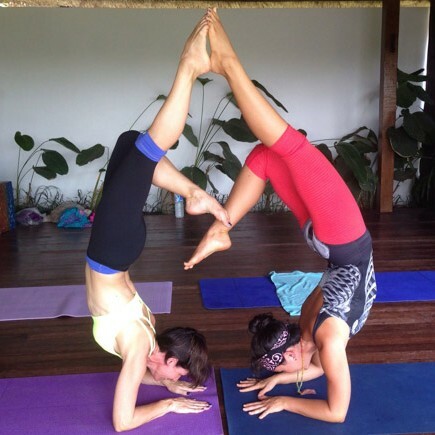 Together they executed a brilliantly organized week full of PILATES & AERIAL YOGA. At the time of going I was reasonably new to Pilates and had NEVER done Aerial Yoga. To be honest, I didn’t really know what to expect – I just knew I needed to go! It still ranks as one of the happiest times in my life. The accommodation was perfect. We were surrounded by rice paddies with a work-out area a short walk away. Our mornings started with Pilates or Yoga, followed by a long lazy breakfast, chatting around the pool, reading, snoozing and sometimes a massage. There was a perfect balance of free time and organized activities. The instructors were available to give private sessions if you wanted and who wouldn’t? Just spending time in their company was a privilege and a time to connect with yourself and think about what was going on in your life. That’s what I love about both Yoga and Pilates – it tends to bring not only the body, but the mind back into alignment. It was only after being there for a few days that I realized how little time I had given to myself over the past years. I strongly believe that to be a good wife, mother, friend, sister and daughter, you HAVE to spend time realizing who you are and what’s really important in your life. Don’t ever sacrifice your exercise time (or any other ‘me’ time) and never feel guilty about doing it. Take time for you, have some fun, do something you would never dream possible… I did and it changed my life! 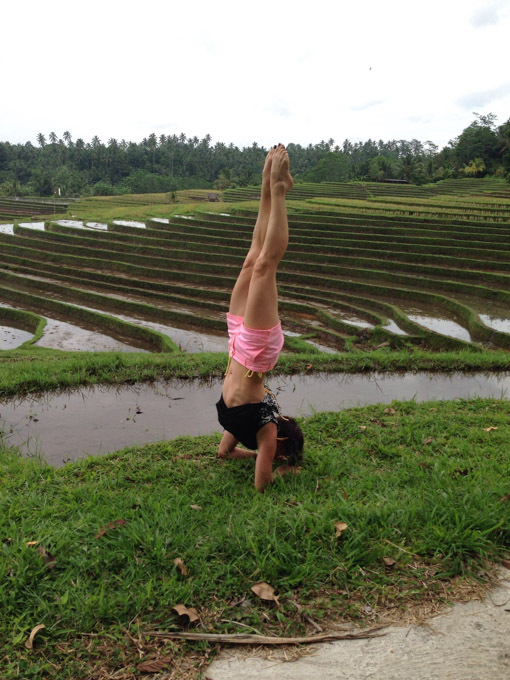 Ricefield forearm stand by our amazing teacher Tash Barnard. How about calling this sweet place your home for a week in May 2017?